So long 2010! Happy New Year! Volunteering at 3 separate community events (Waicon, Supanova, RFLAN) and making a pile of new mates and contacts in the process. Released my first iPhone app and started work on two more. 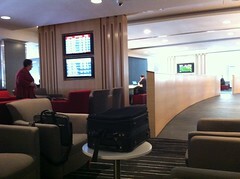 I’m sitting in the domestic Qantas club now. 20 minutes until the gate opens so I thought I’d write a quick blog. There’s an extremely interesting schedule lined up including a day long primer on Cocoa, a cool sounding talk on git as well as a lot of cool Apple-centric presentations in general. Just like my trip to Japan, I’m not sure how much blog time I’ll get, but I’ll try my best to post any cool stuff I learn on Twitter. To all the folks in Perth, enjoy the Royal Show! I’m writing this post on a plane, currently flying out of Hong Kong and headed for Kansai, Japan. Earlier this year, a fellow ECU student and myself were very lucky to receive scholarships to attend a study seminar in Kobe. The seminar will be focused on ‘multicultural symbiosis’, and will run for 2 weeks. It will consist of a lot of pretty interesting activities, including hanging out with a host family and going to make soba noodles out in the countryside. So this time, I plan to leverage the latest social media tech to the extreme, and post updates as a go along. This will probably consist of Twitter updates and Foursquare checkins as often as possible (But hopefully not up to spam levels haha). I learnt from my past trip to Japan that using global roaming on one’s iPhone is a VERY BAD THING TO DO, and this time, I’ve tried renting out a 3G SIM card from DoCoMo, which I’ll report back on here on how well it goes. Anyway, the plane’s about to land. I’ll be posting this the next chance I get. NB: WTF! WordPress flipped my pics! I’ll have to fix that later tho, sorry! So I thought I’d go about this in 2 phases. I’d document down everything that happened, and then write my overall feelings on the matter.